I feel I must give some kind of disclaimer before I plow into this review; I absolutely adored this book. I find myself a little in love with Owen Meany and he has shot straight up into one of my favourite characters of all time. Not quite surpassing Miss Eliza Bennett but definitely on an equal footing with her. But even beyond my Owen infatuation, the story itself has stayed with me and I keep thinking about it, thinking about Owen and thinking about Irving himself. So, dear readers, prepare yourself for much gushing, lots of praise and an emotional, totally biased review. 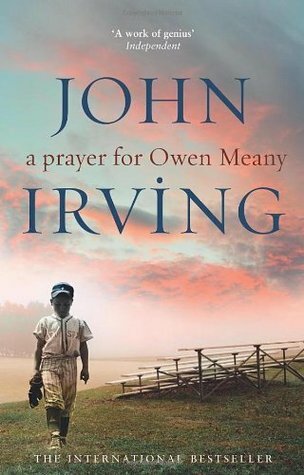 John Irving’s A Prayer for Owen Meany is the inspiring modern classic that introduced two of the author’s most unforgettable characters, boys bonded forever in childhood: the stunted Owen Meany, whose life is touched by God, and the orphaned Johnny Wheelwright, whose life is touched by Owen. From the accident that links them to the mystery that follows them–and the martyrdom that parts them–the events of their lives form a tapestry of fate and faith in a novel that is Irving at his irresistible best. This is story of a friendship between Johnny Wheelwright and Owen Meany. Our narrator is Johnny; his present time is the late 1980s living in Canada after seemingly turning his back on his native USA. He flicks back and forth between his present and through his childhood to early adulthood where he is an observer and commentator to what is truly the story of Owen Meany. Stunted in stature but enormous in character, Owen is Johnny’s childhood friend who becomes more than this title usually means; he is his best friend, his constant companion, co-conspirator, brother. Predominantly, the question being raised in A Prayer for Owen Meany is one of faith. Not only spiritual faith, but a faith in yourself, faith in what you know to be true that keeps you strong even in the face of disbelief and the overwhelming indicators to the contrary. Early on we learn that Owen believes himself to be an instrument of God and that he knows when and how he is going to die. And this is the blueprint for the rest of his life. But how can this be? Certainly those around him that know him best, Johnny and his stepfather Dan refuse to believe it. But the disbelieving child-Johnny becomes the faithful, God-fearing adult-John and it is this set path between the two as laid out by Owen that is an amazing journey of faith by Owen and discovery and growth by John. With this confidence in knowing what fate has in store for him, Owen also has confidence in himself. He is intelligent, he is charismatic, with people gravitating towards him. In Owen, Irving has created a character whose personality outshines whatever shortcomings he has physically, including his “wrecked voice”. There are thoughts here too on war and American politics. If I had one complaint, its that this felt like Irving’s grandstand. There are very personal opinions here that are attributed to the adult John but felt like our authors. And they are quite specific to the time and climate of USA – in the 1960s it is their involvement in the Vietnamese war and in the 1980s it is their dubious political system. Beyond the excellent character development and fully developed themes, the story itself is full, complex and entertaining. There is a degree of suspended disbelief that the reader needs to take on, so be aware if this is something you might not be able to do. I’ve recently learned of the term book hangover and the ending of this book affected me like no other this year. True, this is not my first 5 star of the year, but it does make me want to go back and downgrade the others. As I stated in my opening, I love this book. I want to recommend it, but only if you are going to love it too. Not merely like it and definitely not hate it. I have become quite irrational about it. It goes without saying, but 5/5 rating from me.